Planning a conference? The Commons offers great tools to help with publicity, organization, and registration before your conference. And during the conference, your website and groups on the Commons serve as social hubs, where participants can meet and discuss issues, access information, post presentations, and aggregate tweets. And once the conference is over, the social network you’ve created provides a way for people to stay connected and keep the conversation going, as well as a space to archive what went on. Create a WordPress site on the Commons. Here you can centralize all information about your conference, publish agendas and presentations, advertise, and provide a place where members can blog and comment on other posts. You might want to select a theme with a slider that will showcase presentations and create a buzz. Optionally, create a group or a number of groups on the Commons. This can help with organization, provide an addition place for discussion, and launch a permanent space for like-minded colleagues to meet. Groups can provide a powerful social layer to your conference. Tools include discussion forums, announcement boards, file uploads, docs, email notifications, and reply by email functionality. If you have a group and a blog – consider attaching them for better integration. Learn more about groups and group blogs. Optionally – get a “CUNY.IS/[yourSiteName]” quick link for your conference site or group (or both). These easy-to-remember, short URLs help make the information about your conference easy to find. Use the Announcements group to Call For Proposals, and for publicity and reminders about your conference. Does your conference already have its own domain name? Or does your department or program have a place where events typically reside? No worrries. You can map that address to your site on the Commons. This provides a great way to take advantage of the great functionality available at the Commons while still maintaining a connection to your traditional domain. Users can either type in your domain’s URL or the Commons URL to access the conference site. The Commons is open to faculty, staff, graduate students, and graduate alums (we do make some exceptions and create some temporary accounts). If your conference audience does not fall into these categories, you can still use the Commons, but keep in mind that Non-Commons members cannot join groups. They can view your conference’s public site and post comments on posts and pages, but they will not be able to subscribe and create posts. 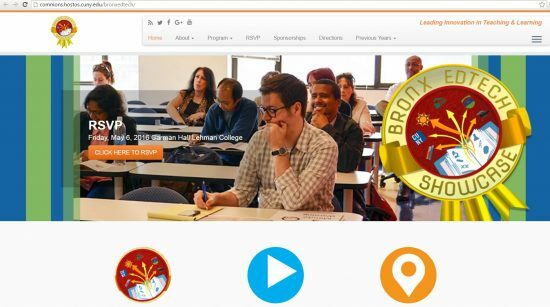 Lehman, Hostos and Bronx Community College use the Commons to host their annual Bronx EdTech Showcase. The site gathers proposals via online forms, posts agendas, showcases presentations, provides directions, and archives past conferences. 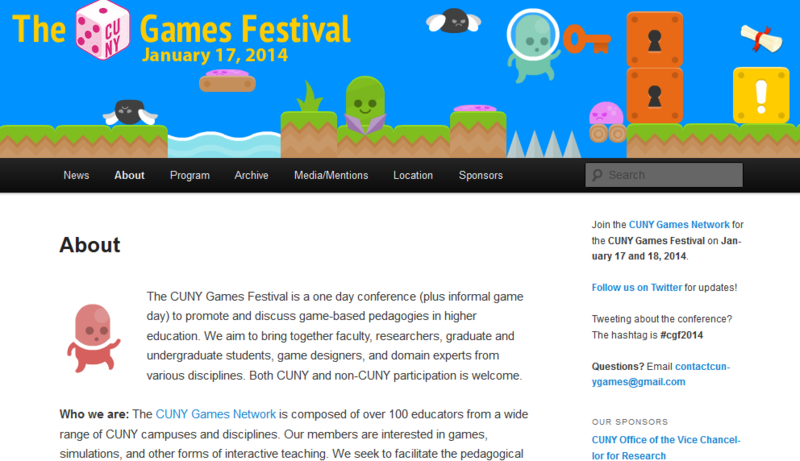 Another great example of how the Commons can be used to host a conference, The CUNY Games Festival used its site to publish its program, recognize sponsors, archive presentations, link to live streaming, provide directions, food and lodging information, and a blog for reflections and wrap-ups. The Commons homepage had a slider promoting the festival, with links to the site and registration page. The Commons lets you create a free website for your conference, and offers a bunch of add-ons that may help both before, during, and after your event. Hope to see your event on the Commons!